I say this because I remember when I was a kid my friends, cousins who were very picky would always eat 2 veggies – paneer and okra. I’m yet to meet a person who doesn’t like bhindi! Sarvesh is a huge fan so I get bhindi every other week from the stores. 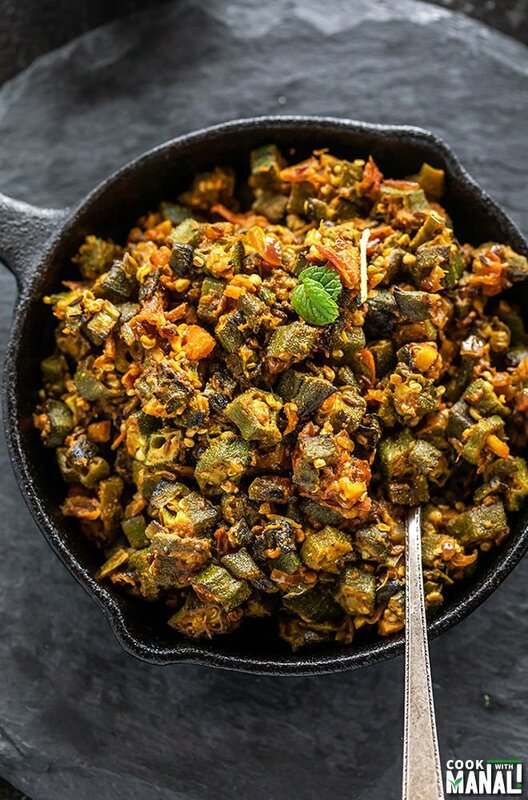 While I do cook it in several ways, this bhindi masala recipe is my absolute favorite. It’s a simple recipe and tastes so good with rotis and paratha. Roti + dal + bhindi masala = pure comfort food for me! I can pretty much have this combination for the rest of my life. However bhindi is not very popular here, in the US. I see it sometimes at Whole Foods but mostly you can get it only at the Indian store. I know it’s used in some southern recipes but other than that, not so much. I think it’s popularity will grow in the coming years since it’s a low calorie vegetable. 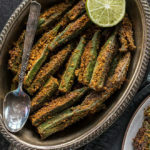 I recently saw baked okra at Trader Joe’s, so it’s definitely getting popular. Not only is bhindi tasty, it also has some amazing health benefits. ✓ rich in folic acid and vitamin B6. ✓ half cup of raw okra has only about 16 calories! 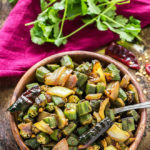 If you are following the very popular keto diet these days, bhindi will be a great addition to your menu. If you cook bhindi often, then you are well aware about this problem – the sliminess! The vegetable exudes a substance called mucilage which makes it slimy. So how do you make it less slimy/sticky? 1. Wash and pat dry the okra before chopping. If you try to cut the okra without pat drying it will be very slimy. I usually wash it and then put all the okras on a paper towel (in single layer) and let them dry for some time and then pat dry each okra with a paper towel. If you can plan in advance, it would be good to wash the okra and then let it air dry overnight. That way you wouldn’t need to pat dry each bhindi separately. You will be good to use the bhindi in the morning straight away. 2. Fry the okra in little oil before adding it to the curry/masala. That’s what I have done in this recipe, fried the okra till all the sliminess disappeared. This takes around 15 minutes on medium-low flame. Do not cook on high flame else the okra will get brown quickly, even before the sliminess can go away. This bhindi masala recipe calls for basic Indian masala with onion, tomatoes, ginger, garlic and spices. We start by cooking the bhindi first until the sliminess almost goes away. Once that is done, then we cook the masala and then add the cooked bhindi to it. Simple isn’t it? And the best way to serve it? With warm roti and dal. That’s my personal favorite but of course you can serve it whatever you like – paratha, rice. Hope you guys like this simple bhindi masala recipe as enjoy it as much as we do. 1- Wash and pat dry the bhindi with a paper towel and then chop it. Set aside. Heat 1 tablespoon oil in a pan on medium heat. Once the oil is hot, add the chopped bhindi to the pan. Let is cook on medium heat for 10 mins, then lower the heat to low and cook 5 more minutes. The bhindi is mostly cooked by now (after 15 mins) and there should be very little sliminess left. Remove pan from heat. 2- To another pan (or use the same pan after transferring bhindi to a bowl), now add the remaining 1.5 tablespoons oil on medium heat. Once the oil is hot, add cumin seeds and let them sizzle for few seconds. 3- Add chopped onion and saute for 2 to 3 minutes until soft. Then add the ginger and green chili and cook for 1 more minute. 4- Add chopped tomatoes and cook for around 4 minutes until soft and mushy. 5- Then add the spices – coriander powder, turmeric, amchur, red chili powder and salt. Mix the spices well with the masala. 6- I added a tablespoon of water at this point so that the spices do not burn. Stir well. 7- Add the cooked bhindi to the pan and mix well. 8- Set heat to low-medium and cook for 5 minutes without covering the pan. Sprinkle with garam masala. Garnish with ginger juliennes if needed. 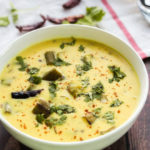 Serve bhindi masala with rotis/paratha/rice. 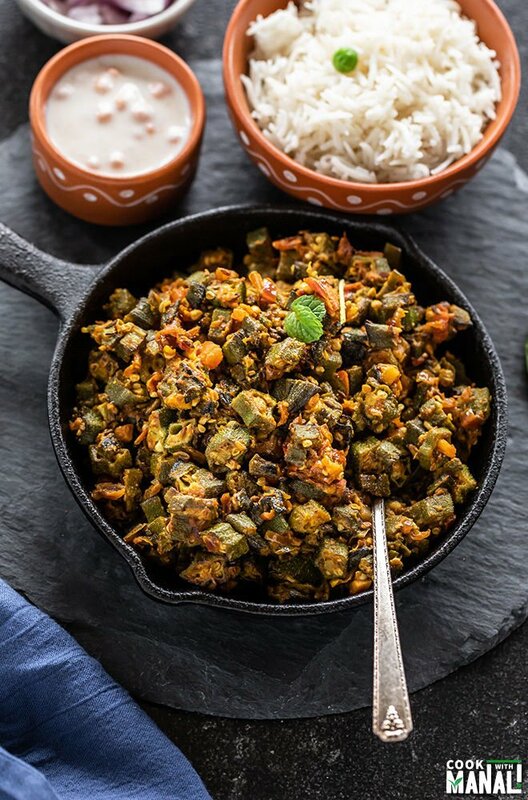 More Bhindi Recipes on the Blog! 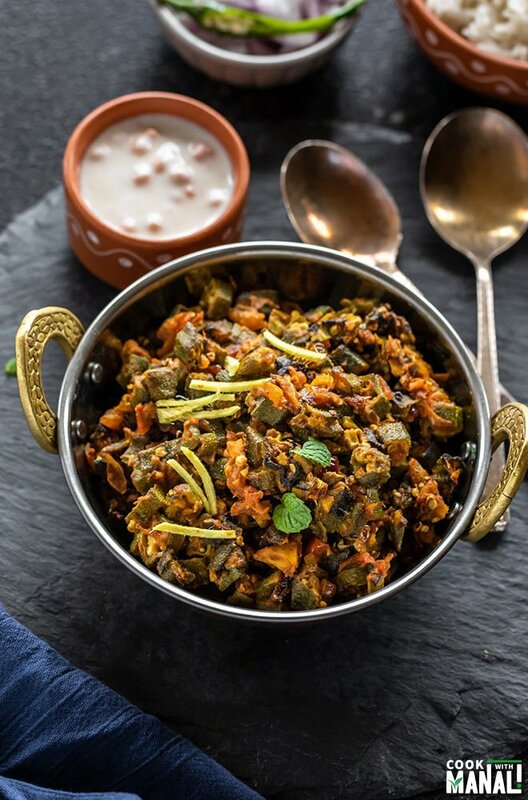 If you’ve tried this Bhindi Masala Recipe then don’t forget to rate the recipe! You can also follow me on Facebook, Instagram to see what’s latest in my kitchen! Indian style okra stir fry with onions, tomatoes and spices! This dish is best enjoyed with warm rotis! Vegan and gluten-free. Wash and pat dry the bhindi with a paper towel and then chop it. Set aside. Heat 1 tablespoon oil in a pan on medium heat. Once the oil is hot, add the chopped bhindi to the pan. Let is cook on medium heat for 10 mins, then lower the heat to low and cook 5 more minutes. To another pan (or use the same pan after transferring bhindi to a bowl), now add the remaining 1.5 tablespoons oil on medium heat. Once the oil is hot, add cumin seeds and let them sizzle for few seconds. Add chopped onion and saute for 2 to 3 minutes until soft. Then add the ginger and green chili and cook for 1 more minute. Add chopped tomatoes and cook for around 4 minutes until soft and mushy. Then add the spices - coriander powder, turmeric, amchur, red chili powder and salt. Mix the spices well with the masala. I added a tablespoon of water at this point so that the spices do not burn. Stir well. Add the cooked bhindi to the pan and mix well. Set heat to low-medium and cook for 5 minutes without covering the pan. Sprinkle with garam masala. Garnish with ginger julienne if needed. 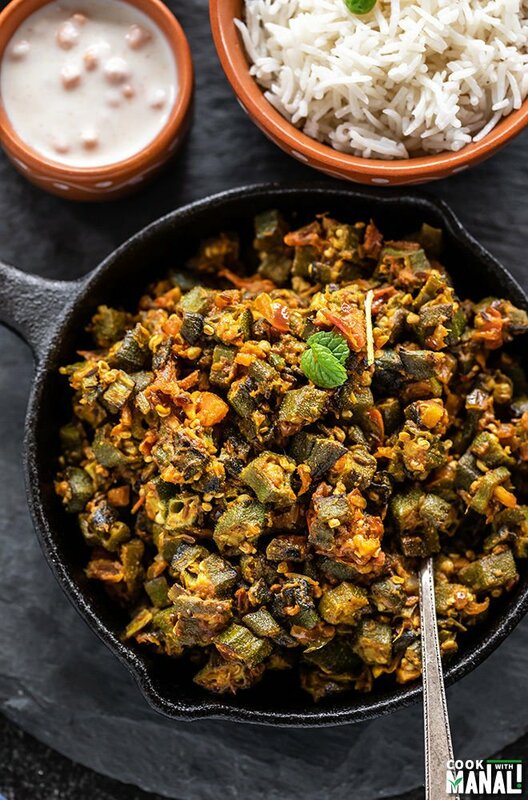 Serve bhindi masala with rotis/paratha/rice. I think I’m just going to make it my life goal to cook everything you make now (: I’ll start with this recipe! aww you are too sweet, let me know if you make this! Hi…I don’t know that I can find fresh okra right now. Can I use frozen, since they would not be completely dry as you suggest for the fresh? If I can, do you have any tips for de-sliming those? I can’t wait to try some of your recipes! 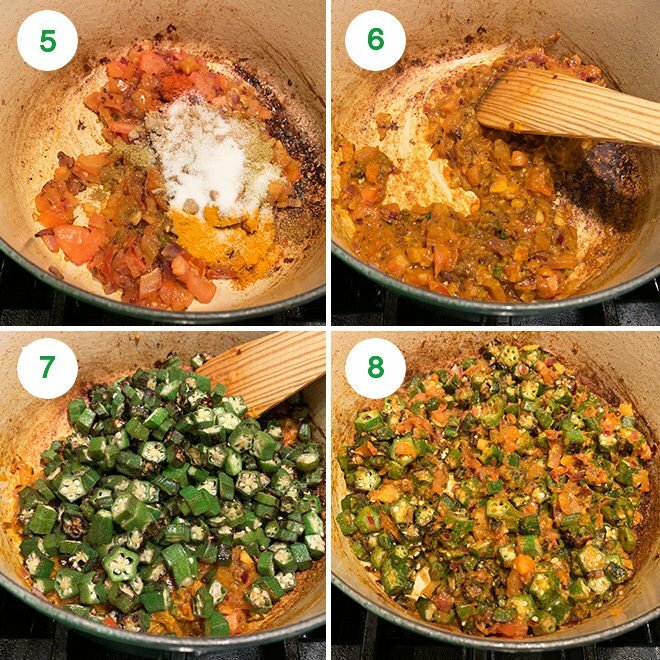 I have the same question, how to make frozen okra less slimy ad cook Indian way? Hi for frozen okra, I would probably place it between 2-3 thick sheet of paper towel ..so that if there’s any ice formation it dries out…I would leave for 1-2 hours or so and then make the recipe as instructed. The frozen okra is usually cut. Hi Ophelia, you can use frozen okra. 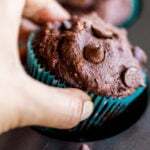 I would probably place it between 2-3 thick sheet of paper towel ..so that if there’s any ice formation it dries out…I would leave for 1-2 hours or so and then make the recipe as instructed. The frozen okra is usually cut. 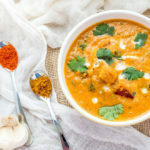 This bhindi masala recipe is looking so tempting. Bhindi is the one of my fav dish. That makes me so happy! 🙂 You are welcome Lisa! bhindi masala racepi is favorite yummy food also mixed with chicken. 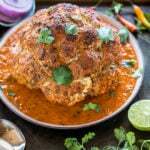 Recipe likhne ka tarika achha laga . Jis tarah se sab kuchh samjhaya gaya hai. 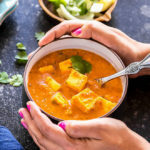 You mention paneer as a vegetable twice? Does this mean anything lacking meat is a vegetable? Is my beloved Coke Zero actually vegetable juice? Please let me know so I can tell my wife immediately. 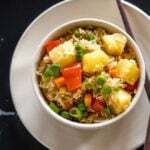 paneer is not a vegetable but Indian cottage cheese but in India we cook it as a vegetable..so as an Indian, I am used to calling it a sabzi (vegetable)..hope this helps.. This came out really well! 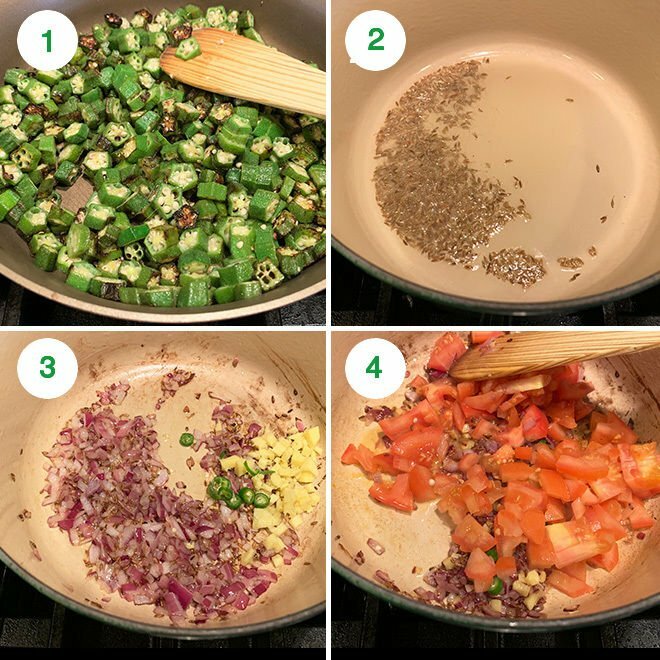 I have never managed to make okra well, this recipe was delicious! My fam loved it! Thanks! Awesome! So glad you all enjoyed it Malvika! 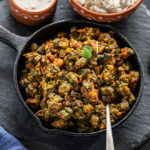 Most amazing Bhindi Masala i have tried. I did cheat and used Rotel no salt added tomatoes with chilies. I also served it with Dosa. This is now be a staple at my house. BTW, you mention garlic as an ingredient, but it’s not listed in the official recipe or with any precise measurement. OMG! Made exactly as recipe states, Jesus Bezus! Banging! Thanks so much that is the goodness i was looking for! Heck with ordering this is way better!